Why is the GST still charged to the customers even though it is zero-rated effective 1st June 2018? Why is there still a GST column in the electric bill? How do prorated calculations work? Why was there no notification notice? What are changes that occur on TNB bills? For the billing calculation, GST starts to be calculated as 0% starting 1st of June 2018. All usage before that date is still subject to a 6% GST charge. The GST charge count is made pro-rated. The GST column shows the amount that will be charged GST. Prior to June 1, the GST rate was 6%. From 1 June 2018, the GST rate is 0%. Please visit the www.myTNB.com.my portal or call TNB CARELINE at 1300-88-5454. Electricity consumption starting 1 June 2018 standard rated at 6% will change to 0%. 1. What does it mean by GST at 0% for Connection Charges? 2. What is the GST treatment under transitional rules for Connection Charges? Where goods are delivered / services are performed before 01 June 2018, the supply is subjected to GST at 6%, regardless of time of payment. Where goods are delivered / services are performed after 01 June 2018, but payment received before 01 June 2018, then, to the extent covered by the payment, the supply is subjected to GST at 6%. Where goods are delivered / services are performed after 01 June 2018 and payment is also received after 01 June 2018, then the supply is subjected to GST at 0%. 3. 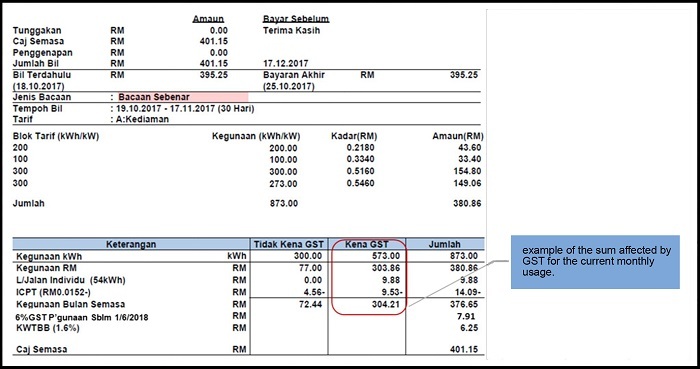 Is Connection Charges for new supply request made after 01 June 2018 no longer subjected to GST at 6%? Yes, for new supply request including additional supply application made after 01 June 2018 are no longer subjected to GST 6%. 4. What is the GST treatment for Connection Charge ProForma that has been issued to customers before 01 June 2018? * CC payment received refers to payment received via cash or cheque. If cheque is bounced, customer has to pay CC based on initial amount as stated in the ProForma (including GST at 6% if any). Indent is NOT considered as payment of CC.